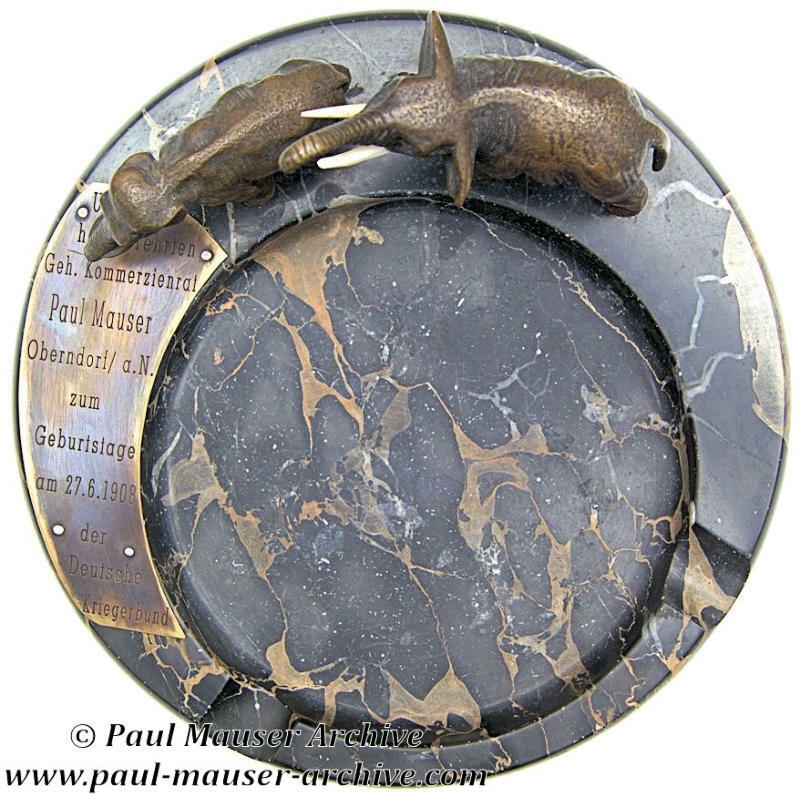 This page summarizes some topics discussed in great details in the Paul Mauser book. In our recent book (Paul Mauser - His Life, Company, and Handgun Development 1838 - 1914), for the first time, we provide a very detailed history of the Turkish – Mauser relationship based upon historical documents available in the Paul Mauser and early Mauser archive. We describe this relationship from 1886 until April 1911. 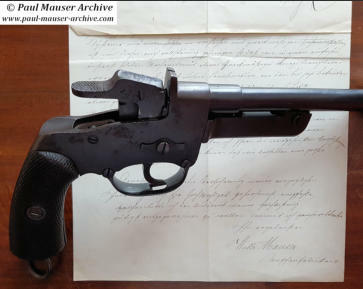 In fact, we complete our analysis in 1911, showing for the first time the original letters exchanged between Paul Mauser and his nephew Paul Mauser II that was in Turkey to follow comparative tests between Luger, C96 and Browning pistols. These documents will be of interest also for Luger and Browning collectors interested in this history. 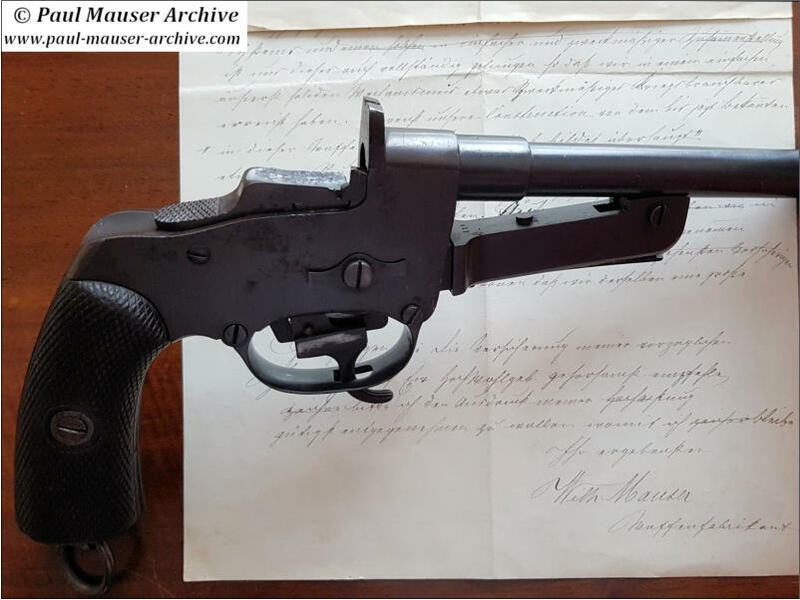 Mauser collectors have a unique opportunity to access original historical documents never published before. 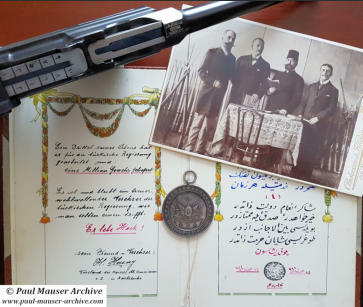 You will discover the Paul’s happiness for the first rifle contract and his disappointment for the C96 contract… Paul Mauser himself was aware that the first Turkish contract for rifle and carbine signed on the 12th of February 1887 changed forever the history of the Mauser Company. For Paul Mauser the first Turkish contract was so important that a specific celebration was done for the 25th anniversary of the contract and a special note is available in his 1912 diary as reported at page 155 of the book. The photo above shows some very interesting objects together with a Turkish C96 pistol. 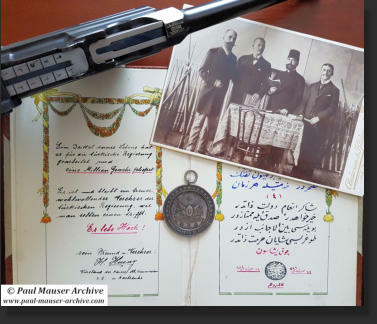 The booklet in the centre, written in German and old Turkish, has been offered to Paul Mauser for his 70th birthday in 1908 by Husny Bey, President of the Imperial Ottoman Commission in Karlsruhe and very good friend of Paul. Husny Bey is the Turkish person in the middle of the photo and on the left, Mr. Doll, Mr. Schmid – Mauser managers. The photo shows also 1893 rifles and it has been taken most probably when an “active” contract was amended to incorporate the improved design. The complete translation made by Gerben of the booklet is available at page 163 of the book. 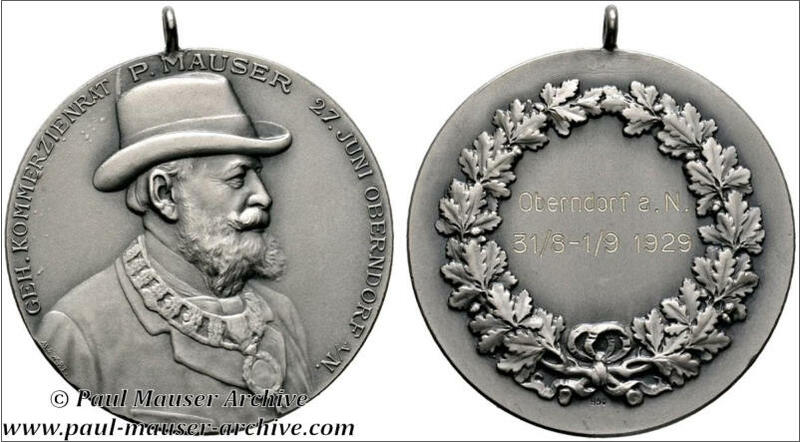 The medal in the centre is a rare one offered to Paul Mauser, Feederle and others Mauser representatives by the Turkish committee in Oberndorf on the 31st of August 1894 to celebrate the 18th years of the reign of the Sultan Abdul Hamid II. For this celebration, there was also a shooting competition in Oberndorf. The entire story at page 153-165 of the book. I n our new book on Paul Mauser, the German inventor and industrialist is for sure the main actor of the book however we also spend time analysing in details the relationship between Paul and his brother Wilhelm (chapter The Mauser brothers and Oberndorf – page 75 … 83). The relationship between the two men was a difficult one and we use Paul Mauser diaries notes and original letters exchanged between the two brothers to explain this. This difficult relationship will continue also after the death of Wilhelm (1882) between Paul Mauser and the son of Wilhelm, Alfons. 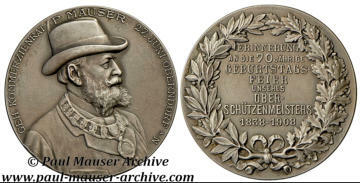 In any case, in the first years of the Mauser story, until Wilhelm passed away in 1882, the two brothers worked together and, speaking about pistols, Wilhelm was involved with Paul in the design and production of two models the C77 and the C78 (Zig-Zag Revolver). 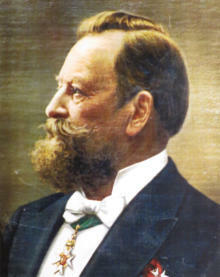 In the book, the Zig-Zag revolver enthusiasts can find an interesting amount of original letters, for the first time available, fully translated, between Paul and Wilhelm related to the production and marketing of the C78 revolver (chapter Marketing the Zig-Zag Revolver – page 191 … 203). 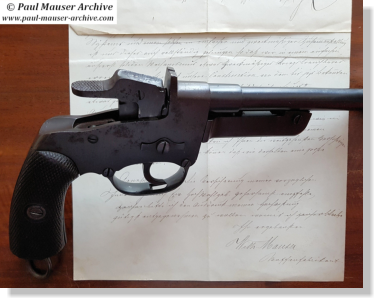 I am presenting here a very rare set composed by the single-shot Hinterladung (rear-loader) Mauser C77 pistol together with the unique letter available in the Paul Mauser archive where Wilhelm Mauser describes this pistol to a Swedish governmental representative – note the Wilhelm signature at the end with “Waffenfabrikant”. 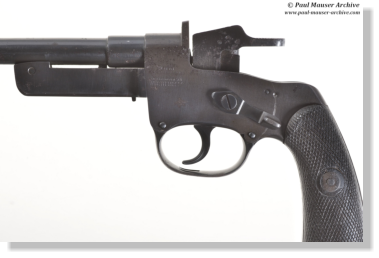 The letter is quite long and in the beginning Wilhelm discussed about rifles but, almost at the end of the letter, he introduces the “new” pistol, stressing the advantage of the his design. The full translation of the letter is available at page 90 of the book. 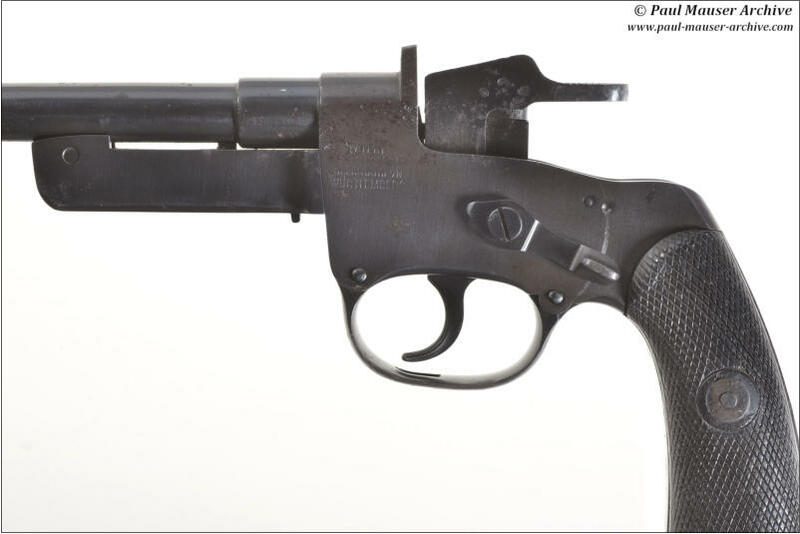 The Mauser C77 is the first pistol produced by the two Mauser brothers and only a few are today reported. The total production is around 150 pistols concentrated in 1877-78. The complete explanation about the very effective loading mechanism is available in the book. In the book, the reader can also see when the first C77 has been sold and to whom based upon the data of the sale books. On the 27th of June Paul turned 70. This was a special day. He received presents from family, institutions and collaborators. 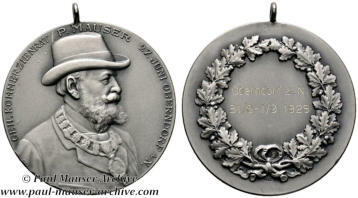 This silver medal is from the shooting federation. 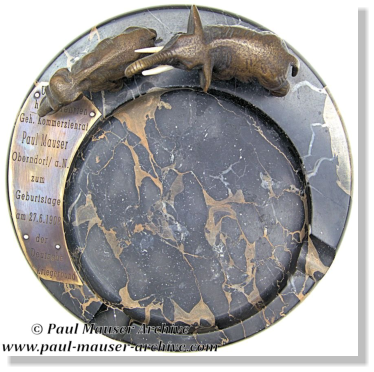 The ash tray with two bronze elephants that represent both the taste for the exotic of that period as well as the recollection of big game hunting, is from the Deutsche Kriegerbund (War Veterans Association). More information at page 64-65 of the book . 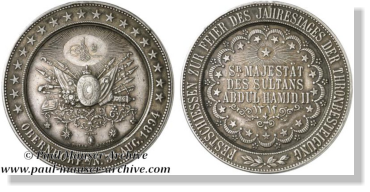 This rare medal was offered to Paul Mauser, Feederle and others Mauser representatives by the Turkish committee in Oberndorf on the 31st of August 1894 to celebrate the 18th years of the reign of the Sultan Abdul Hamid II. More information at page 158 of the book . 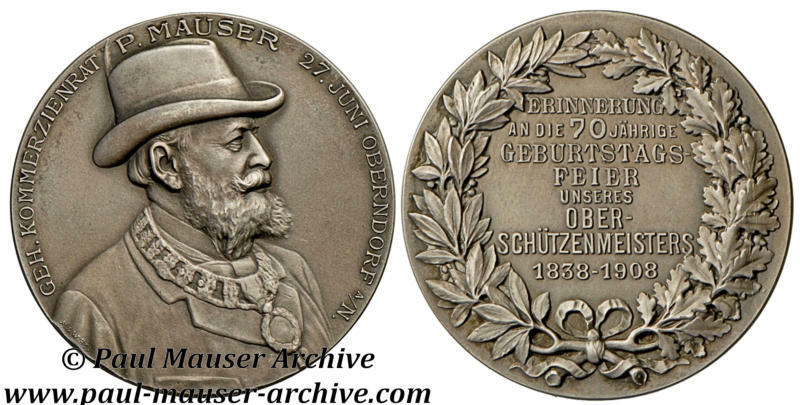 1929 shooting medal that commemorates the Mauser medal for the Mauser’s 70th birthday. 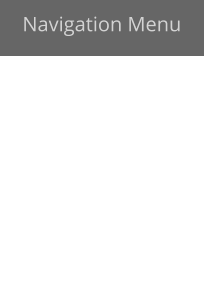 I n o u r r e c e n t b o o k ( P a u l M a u ser - H i s L i f e , C o m p a n y , a n d H a n d g u n D e v e l o p m e n t 1 8 3 8 - 1 9 1 4 ) , f o r t h e f i r s t t i m e , we p r o v i d e a v e r y d e t a i l e d h i s t o r y o f t h e T u r k ish – M a u s e r r e l a t i o n s h i p b a s e d u p o n h i s t o r i c a l d o c u m e n t s a v a i l a b l e i n t h e P a u l M a u s e r a n d e a r l y M a u s e r a r c h ive. W e d e s c r i b e t h i s r e l a t i o n s h i p f r o m 1 8 8 6 u n t i l A p r i l 1 9 1 1. In f a c t , w e c o m p l e t e o u r a n a l y s i s i n 1 9 1 1 , s h o w i n g f o r t h e f i r s t t i m e t h e o r i g i n a l l e t t e r s e x c h a n g e d b e t w e e n P a u l M a u s e r a n d h i s n e p h e w P a u l M a u s e r I I t h a t w a s i n T u r k e y t o f o l l o w c o m p a r a t i v e t e s t s b e t w e e n L u g e r , C 9 6 a n d B r o w n i n g p i s t o l s . T h e s e d o c u m e n t s w i l l b e o f i n t e r e s t a l s o f o r L u g e r a n d B r o w n i n g c o l l e c t o r s i n t e r e s t e d i n t h i s h i s t ory. Mauser collectors have a unique opportunity to access original historical documents never published before. 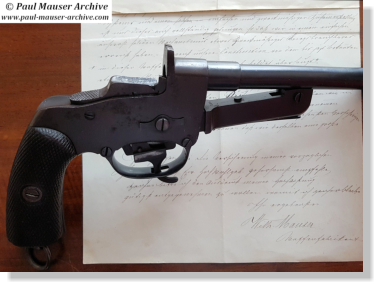 You will discover the Paul’s happiness for the first rifle contract and his disappointment for the C96 contract… Paul Mauser himself was aware that the first Turkish contract for rifle and carbine signed on the 12th of February 1887 changed forever the history of the Mauser Company. For Paul Mauser the first Turkish contract was so important that a specific celebration was done for the 25th anniversary of the contract and a special note is available in his 1912 diary as reported at page 155 of the book. 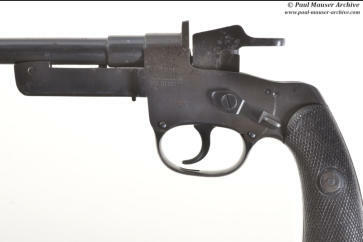 The photo above shows some very interesting objects together with a Turkish C96 pistol. 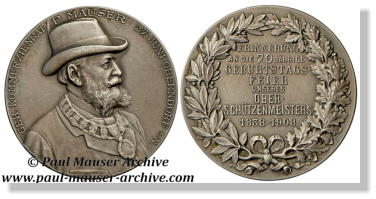 The booklet in the centre, written in German and old Turkish, has been offered to Paul Mauser for his 70th birthday in 1908 by Husny Bey, President of the Imperial Ottoman Commission in Karlsruhe and very good friend of Paul. Husny Bey is the Turkish person in the middle of the photo and on the left, Mr. Doll, Mr. Schmid – Mauser managers. The photo shows also 1893 rifles and it has been taken most probably when an “active” contract was amended to incorporate the improved design. The complete translation made by Gerben of the booklet is available at page 163 of the book. 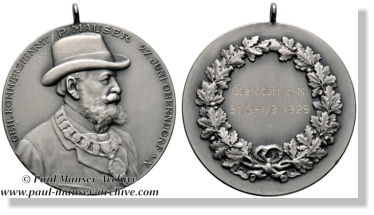 The medal in the centre is a rare one offered to Paul Mauser, Feederle and others Mauser representatives by the Turkish committee in Oberndorf on the 31st of August 1894 to celebrate the 18th years of the reign of the Sultan Abdul Hamid II. For this celebration, there was also a shooting competition in Oberndorf. The entire story at page 153-165 of the book. I n o u r n e w b o o k o n P a u l M a u s e r , t h e G e r m a n i n v e n t o r a n d i n d u s t r i a l ist is f o r s u r e t h e m a i n a c t o r o f t h e b o o k h o w e v e r w e a l s o s p e n d t i m e a n a l y s i n g i n d e t a i l s t h e r e l a t i o n s h i p b e t w e e n P a u l a n d h i s b r o t h e r W i l h e l m ( c h a p t e r T h e M a u s e r b r o t h e r s a n d O b e r n d o r f – p a g e 75 … 83). T h e r e l a t i o n s h i p b e t w e e n t h e t w o m e n w a s a d i f f i c u l t o n e a n d w e u s e P a u l M a u s e r d i a r i e s n o t e s a n d o r i g i n a l l e t t e r s e x c h a n g e d b e t w e e n t h e t w o b r o t h e r s t o e x p l a i n t h i s . T h i s d i f f i c u l t r e l a t i o n s h i p w i l l c o n t i n u e a l s o a f t e r t h e d e a t h of W i l h e l m ( 1 8 8 2 ) b e t w e e n P a u l M a u s e r a n d t h e s o n o f W i l h e l m , A l f o n s. I n a n y c a s e , i n t h e f i r s t y e a r s of t h e M a u s e r s t o r y , u n t i l W i l h e l m p a s s e d a w a y i n 1 8 8 2 , the t w o b r o t h e r s w o r k e d t o g e t h e r a n d , s p e a k i n g a b o u t p i s t o l s , W i l h e l m w a s i n v o l v e d w i t h P a u l i n t h e d e s i g n a n d p r o d u c t i o n of t w o m o d e l s t h e C 7 7 a n d t h e C 7 8 ( Z i g - Z a g R e v o lver). I n t h e b o o k , the Z i g - Z a g r e v o l v e r e n t h u s i a s t s c a n f i n d a n i n t e r e s t i n g a m o u n t o f o r i g i n a l l e t t e r s, for t h e f i r s t t i m e a v a i l a b l e , f u l l y t r a n s l a t e d , b e t w e e n P a u l a n d W i l h e l m r e l a t ed to t h e p r o d u c t i o n a n d m a r k e t i n g o f t h e C 7 8 r e v o l v e r ( c h a p t e r M a r k e t i n g t h e Z i g - Z a g R e v o l ver – p a g e 1 9 1 … 203). I am p r e s e n t i n g h e r e a v e r y r a r e s e t c o m p o s e d by t h e s i n g l e - s h o t H i n t e r l a d u n g ( r e a r - l o a d e r ) M a u s e r C 7 7 p i s t o l t o g e t h e r w i t h t h e u n i q u e l e t t e r a v a i l a b l e i n t h e P a u l M a u s e r a r c h i v e w h e r e W i l h e l m M a u s e r d e s c r i b e s t h i s p i s t o l to a S w e d i s h g o v e r n m e n t a l r e p r e s e n t a t i v e – n o t e t h e W i l h e l m s i g n a t u r e a t t h e e n d w i t h “ W a f f e n f a b r i k a nt”. T h e l e t t e r i s q u i t e l o n g a n d i n t h e b e g i n n i n g W i l h e l m d i s c u s s e d a b o u t r i f l e s b u t , a l m o st at t h e e n d o f t h e l e t t e r , he i n t r o d u c e s the “ n e w ” p i s t o l , s t r e s s i n g t h e a d v a n t a g e of t h e h i s d e s i g n . T h e f u l l t r a n s l a t i o n of t h e l e t t e r i s a v a i l a b l e a t p a g e 90 of t h e b o o k . T h e M a u s e r C 7 7 is the f i r s t p i s t o l p r o d u c e d b y t h e t w o M a u s e r b r o t h e r s a n d o n l y a few a r e t o d a y r e p o r t e d . T h e t o t a l p r o d u c t i o n is a r o u n d 1 5 0 p i s t o l s c o n c e n t r a ted in 1 8 7 7 - 7 8 . T h e c o m p l e t e e x p l a n a t i o n a b o u t the v e r y e f f e c t i v e l o a d i n g m e c h a n i s m is a v a i l a b l e in the book. I n t h e b o o k , t h e r e a d e r c a n a l s o s e e w h e n t h e f i r s t C 7 7 h a s b e e n s o l d a n d t o w h o m b a s e d u p o n t h e d a t a o f t h e s a l e b o o k s.
O n t h e 2 7 t h o f J u n e P a u l t u r n e d 70. T h i s w a s a s p e c i a l d a y . H e r e c e i v e d p r e s e n t s f r o m f a m i l y , i n s t i t u t i o n s and c o l l a b o r a t o r s . T h i s s i l v e r m e d al is f r o m t h e s h o o t i n g f e d e r a t i o n . T h e a s h t r a y w i t h t w o b r o n z e e l e p h a n t s t h a t r e p r e s e n t b o t h t h e t a s t e f o r t h e e x o t i c of t h a t p e r i o d as w e l l a s t h e r e c o l l e c t i o n of b i g g a m e h u n t i ng, is f r o m t h e D e u t s c h e K r i e g e r b u n d ( W a r V e t e r a n s A s s o c i a t i o n ) . M o r e i n f o r m a t i on at p a g e 6 4 - 65 of t h e b o o k . T h i s r a r e m e d a l w a s o f f e r ed to P a u l M a u s e r , F e e d e r l e a n d o t h e r s M a u s e r r e p r e s e n t a t i v e s b y t h e T u r k i s h c o m m i t t e e in O b e r n d o r f o n t h e 3 1 s t o f A u g u s t 1 8 9 4 t o c e l e b r a t e t h e 1 8 t h y e a r s o f t h e r e i g n o f t h e S u l t a n A b d u l H a m i d II. M o r e i n f o r m a t i on at p a g e 1 5 8 o f t h e b o o k . 1 9 2 9 s h o o t i n g m e d a l t h a t c o m m e m o r a t e s the M a u s e r m e d al for t h e M a u s e r ’ s 7 0 t h b i r t h day.